In this tutorial, learn the basics of scripting in Unity by creating a classic arena shooter whereby geometric shapes try to crush you. Much of the power of Unity is in its rich scripting language, C#. You can use it to handle user input, manipulate objects in the scene, detect collisions, spawn new GameObjects and cast directional rays around the scene to help with your game logic. It might sound intimidating, but Unity exposes well-documented APIs that make these tasks a breeze – even for novice developers! In this tutorial, you’ll create a top-down shooter that uses Unity scripting to handle the spawning of enemies, player control, firing projectiles and other important aspects of the gameplay. Note: This tutorial assumes you already have some experience with C# or similar programming languages and an understanding of Unity’s interface and workflow. 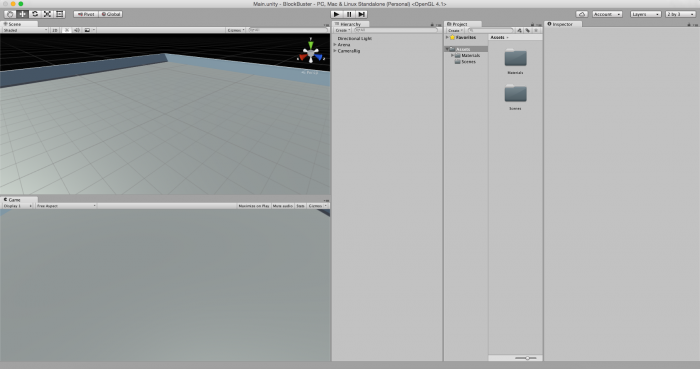 If you need a refresher, check out our detailed Introduction to Unity tutorial. This tutorial was written for Unity 5.3 or greater. You can download the latest version of Unity here. While Unity also supports UnityScript and Boo, C# is the programming language that most developers tend to use, and with good reason. C# is used by millions of developers around the globe for application, web and game development and there’s a plethora of information and tutorials to help you out. Download the BlockBuster starter project, unzip it and open the created folder in Unity. Take a look around in the Scene view. There’s a small arena which will be the battleground for the game, a camera and a light. 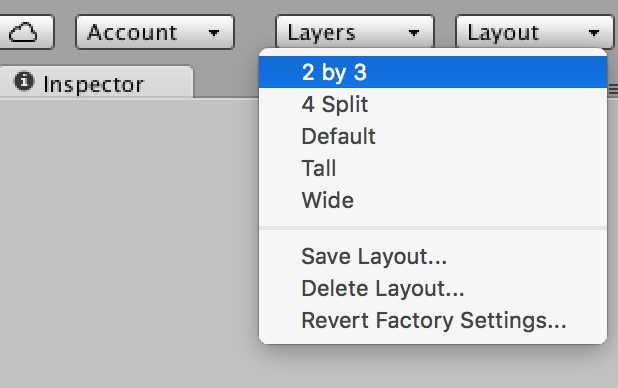 If your layout is different than in the screenshot, select the top-right drop down menu and change it to 2 by 3. What’s a game without a hero? Your first task is to create a GameObject to represent the player in the scene. 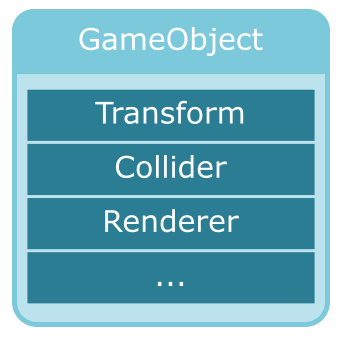 Tranform: Every GameObject comes with this component. It holds the position, rotation and scale of a GameObject. Box Collider: A collider in the shape of a cube which can be used to detect collisions. Mesh Filter: The mesh data which is used to show a 3D model. The Player GameObject will need to respond to collisions with other objects in the scene. To make this happen, select the Player in the Hierarchy window and click the Add Component button in the Inspector window. Select Physics > Rigidbody in the menu that pops up, this will add a Rigidbody component to the Player so it can make use of Unity’s physics engine. 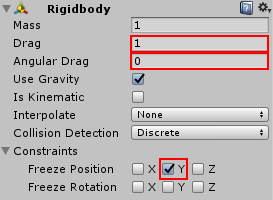 Adjust the Rigidody’s values like this: Set Drag to 1, Angular Drag to 0 and check the Y checkbox next to Freeze Position. This will make sure the Player won’t be able to move up and down and has no added damping when rotating. Now that the Player is ready, it’s time to create the script that will take input from the keyboard and move the Player around. In the Project window, click the Create button and select Folder. Name the new folder Scripts and create a subfolder within it named Player. Note: Using folders like this makes it easy to organize everything by their role and reduces clutter. You’ll be making several scripts for the Player to use so it makes sense to give it its own folder. Double-click the PlayerMovement.cs script. This will open your preferred code editor with the script loaded. Unity comes with MonoDevelop pre-installed on all platorms and Windows users can choose to install Visual Studio and use that instead when they run the installer. This tutorial assumes you’re using MonoDevelop but Visual Studio users should be able to follow along without any issues. Start(): This method will get called once right before the script gets its first update. Update(): While the game is running and the script is enabled, this method will get fired every frame. OnDestroy(): This method gets called right before the GameObject this script is attached to gets destroyed. OnCollisionEnter(): When the collider or rigidbody this script is attached to touches another collider or rigidbody, this method gets called. 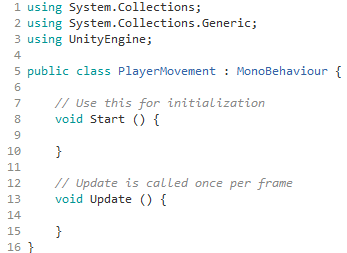 For a full list of events, check out Unity’s documentation on MonoBehaviours. These are public variable declarations, which means that these variables will be visible in the Inspector and can be tweaked without having to go back and forth between the script and the editor. acceleration describes how much the Player's speed increases over time. maxSpeed is the “speed limit”. Private variables can’t be set through the Inspector, it’s the developers’ responsibility to initialize them at the appropriate time. rigidBody will hold a reference to the Rigidbody component that’s attached to the Player GameObject. inputKeys is an array of keycodes that will be used to detect input. directionsForKeys holds an array of Vector3 variables, which will hold directional data. This piece of code links the corresponding directions for each key, e.g. pressing W moves the object forward. The last line gets a reference to the atttached Rigidbody component and saves it in the rigidBody variable for later use. To actually move the Player, you’ll have to handle input from the keyboard. FixedUpdate() is frame rate independent and should be used when working with Rigidbodies. Instead of running as fast as possible, this method will be fired at a constant interval. This loop checks to see if any of the input keys were pressed. Get the direction for the pressed key, multiply it by the acceleration and the number of seconds it took to complete the last frame. This produces a direction vector (speed on the X, Y and Z axes) that you'll use to move the Player object. If you are new to game programming, you might ask yourself why you have to multiply by Time.deltaTime. While the game is running the framerate (or frames per second) will vary depending on the hardware and the stress it is under, this might cause things to happen too fast on powerful machines and too slow on weaker ones which can cause undesired behaviour. The general rule is when you perform an action every (fixed) frame, you need to multiply by Time.deltaTime. The above method applies force to the ridigbody, causing it to move. If the current speed exceeds maxSpeed, the force goes in the opposite direction to slow the player down and effectively limits the maximum speed. Perfect! Save this script and return to the Unity editor. In the Project window, drag the PlayerMovement script onto the Player inside the Hierarchy. Adding a script to a GameObject creates an instance of a component, which means all the code will get executed for the GameObject you attached it to. However, there is one obvious issue - the player can quickly move out of sight, which makes it a little difficult to fight the bad guys. In the Scripts folder, create a new script called CameraRig and attach it to the Main Camera. Need a bit of help to figure out the steps? You can check the hint below for the solution. As you might have guessed, moveSpeed is the speed with which the camera will follow the target – which can be any game object inside the scene. This code gets a reference to the parent Camera object's transform in the scene hierarchy. Every object in a scene has a Transform, which describes the position, rotation and scale of an object. The CameraRig movement code is a bit simpler than the one in PlayerMovement. This is because you don't need a Rigidbody; simply interpolating between the positions of the rigTransform and target is enough. Vector3.Lerp() takes two points in space and a float in the range of [0, 1], which describes a point along the two endpoints. The left endpoint is 0, and the right endpoint is 1. Passing in 0.5 to Lerp() would return a point exactly between both endpoints. This moves the rigTransform closer to the target position with a little bit of easing. In short – the camera follows the player. Run the game and move around the scene; the camera should follow the target transform smoothly wherever it goes. A shooter game without enemies would be easy to beat, but a bit boring. :] Create an enemy cube by clicking GameObject\3D Object\Cube from the top menu. Rename your Cube to Enemy and add a Rigidbody component. In the Inspector, first set the Cube's Transform to (0, 0.5,4). 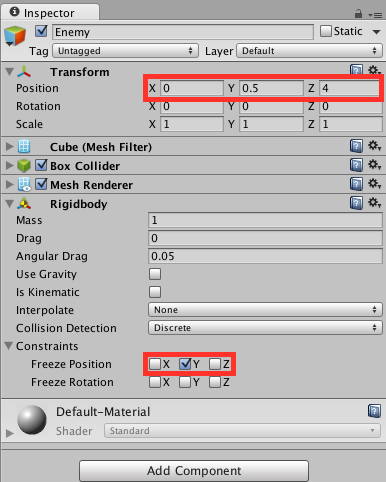 In the Constraints section of the Rigidbody component, check the Y checkbox in the Freeze Position category. Excellent - now to make your enemies move around in a menacing manner. Create a script named Enemy in the Scripts folder. You should be a pro at this by now, but if not, check the instructions earlier in the tutorial for reference. You probably can figure out what those variables represent without too much difficulty. You used moveSpeed earlier to create the camera rig, and it has the same effect here. health and damage help determine when an enemy should die and how much their death will hurt the Player. Finally, targetTransform references the Player's transform. Speaking of the Player, you'll need to create a class to represent all the Player goodness that the enemy wants to destroy. In the Project Browser, select Player folder and create a new script named Player; this script will react to collisions and keep track of the Player's health. Double-click the script to edit it. 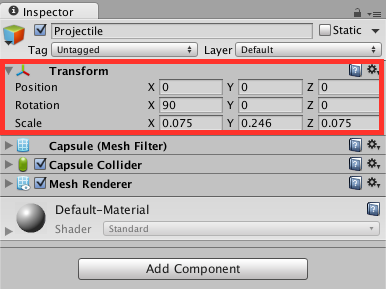 This provides a default value for the health, but it can be modified in the Inspector as well. 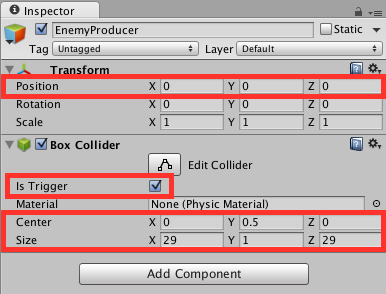 OnCollisionEnter() triggers when two rigidbodies with colliders touch. The Collision argument contains information about such things as contact points and impact velocities. In this case, you're only interested in the Enemy component of the colliding object, so you can call collidedWithEnemy() and execute the attack logic – which you'll add next. You're already familiar with FixedUpdate(), the slight difference is you're using MoveTowards() instead of Lerp(). This is because the Enemy should move at the same speed all the time and not ease-in as it approaches the target. When an enemy is hit with a projectile, TakeDamage() is called; when the Enemy gets to 0 health it will destroy itself. Attack() is similar - it applies damage to the Player and then the enemy destroys itself. The player will take damage and the enemy will self destruct in the process. In the game, an Enemy collising with the Player constitutes a valid enemy attack. 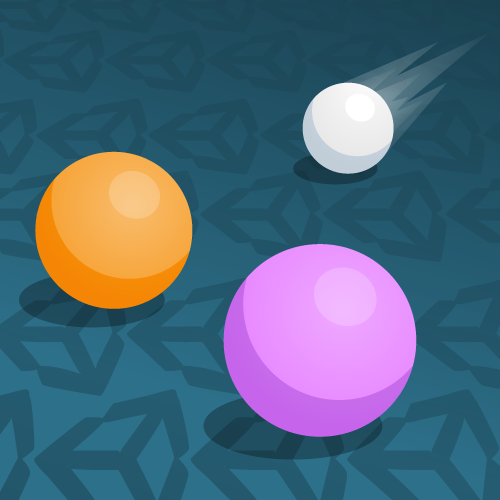 Detecting collisions with Unity's physics is almost a trivial task. Finally, attach the Player script to the Player in the Hierarchy. Aha - the Player can collide not only with enemies, but also other parts of the game world, such as the Arena. These game objects don't have an Enemy script and therefore GetComponent() returns null. Simply running around and avoiding enemies is a pretty one-sided game. Its time to arm the Player for combat. Each time the Player shoots, it will fire an instance of Projectile. To make this happen, you need to create a Prefab. 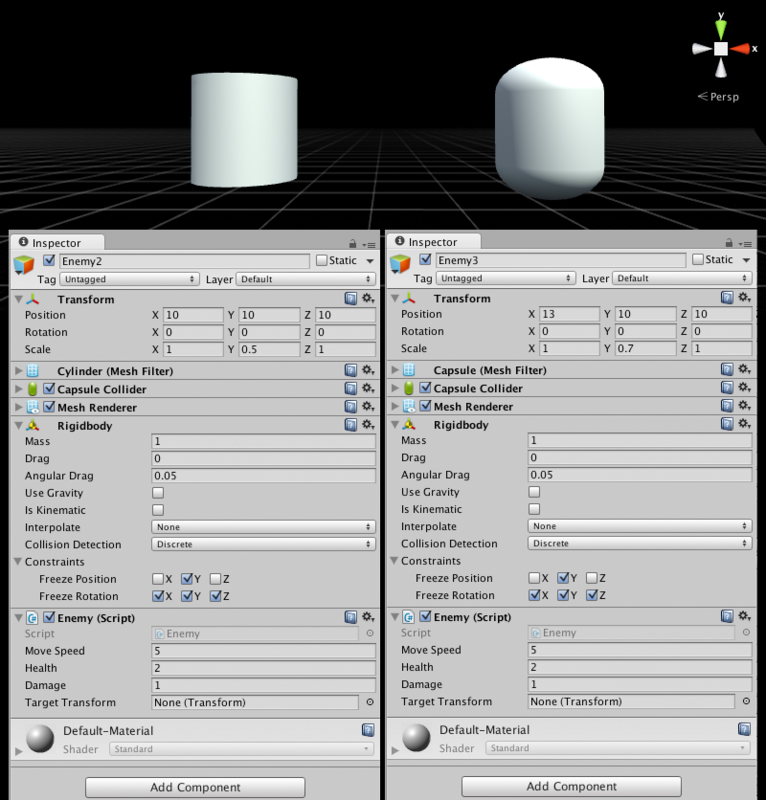 Unlike the objects you already have in the scene, Prefabs are created on-demand by the game logic. Create a new folder under Assets, called Prefabs. Now drag the Projectile object into this folder. That's it: you have a Prefab! Just like any moving object so far in this tutorial, this one will also have speed and damage variables, since it's part of the combat logic. The shootDirection vector determines where the Projectile will go. The Projectile moves differently than everything else in this game. It doesn't have a target, or some force applied to it over time; instead, it moves in a predetermined direction for its entire lifecycle. Here you set the starting position and direction of the Prefab. This Ray argument seems pretty mysterious, but you'll soon learn how it's calculated. If a projectile collides with an enemy, it calls TakeDamage() and destroys itself. In the scene Hierarchy, attach the Projectile script to the Projectile GameObject. Set the Speed to 0.2 and Damage to 1, then click the Apply button located near the top of the Inspector. This will apply the changes you just made to all instances of this prefab. Remove the Projectile object from the scene Hierarchy - you don't need it anymore. Now that you have a prefab that can move and apply damage, you're ready to start shooting. The first variable will contain a reference to the Projectile Prefab you created earlier. Every time your Player fires a projectile, you'll create a new instance from this Prefab. The mask variable is used to filter GameObjects. Wait, casting Rays? What is this sorcery? No, there's no black magic afoot - there are times in your game when you'll need to know if a collider exists in a particular direction. To do this, Unity can cast an invisible ray from a certain point to a direction you specify. You'll likely encounter a lot of GameObjects that intersect with the ray, so using a mask lets you filter out any unwanted objects. Raycasts are incredibly useful and can used for a variety of purposes. They're commonly used to test if another player has been struck by a projectile, but you can also use them to test if there is any geometry underneath a mouse pointer. To learn more about Raycasts, check out this Unity live training video on the Unity site. Now it's time for you to fire your own rays. Instantiates a projectile Prefab and gets its Projectile component so it can be initialized. 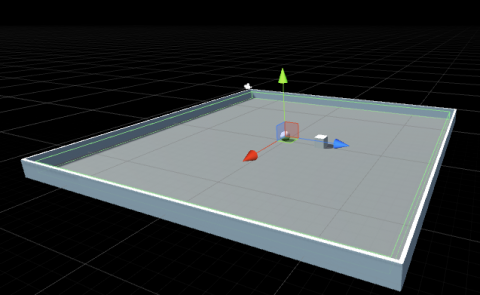 Calculates the direction from the Player GameObject to pointAboveFloor. Creates a new ray that describes the projectile trajectory by its origin and direction. 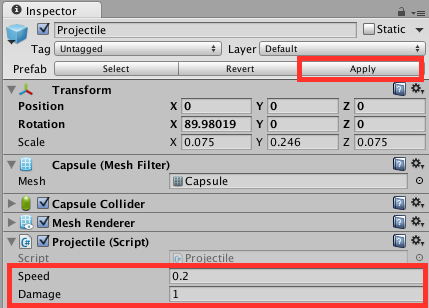 This line tells Unity's physics engine to ignore collisions between the Player collider and Projectile collider. Otherwise OnCollisionEnter() in the Projectile script would be called before it had the chance to fly off. Finally, it sets the trajectory for the projectile. Note: Using Debug.DrawRay() when ray casting is invaluable as it can help you visualize how the ray looks and what it hits. 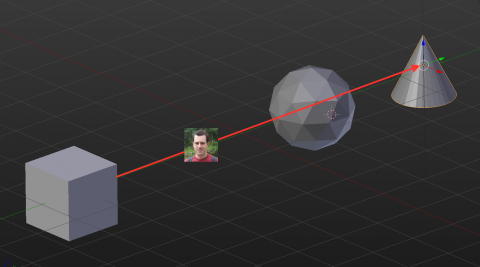 This method casts a ray from the camera to the point where the mouse clicked. Then it checks to see if this ray intersects a game object with the given LayerMask. On every update, the script checks for a left mouse button press. If it finds one, it calls raycastOnMouseClick(). Note: Unity comes with a limited amount of predefined layers from which you can create masks. For more information about layers, check out Unity's Layers documentation. Run the project and fire at will! The projectiles are fired in the desired direction, but something seems a bit off, doesn't it? Note: RotateTowards is very similar to MoveTowards, but it treats vectors as directions instead of positions. Also, you don't need to change rotation over time so using a step close to zero will suffice. Transform rotations in Unity are expressed using quaternions, which are beyond the scope of this tutorial. All you need to know for this tutorial is that they have advantages over vectors when making calculations that involve rotations in 3D. Remove the Debug.DrawRay calls as you won't need them further. To keep the player guessing, you can randomize the health, speed and location of each Enemy. The green wire outlines represent a collider. You are about to write a script that picks a random location in this space along the X and Z axis and instantiates an enemy Prefab. The first variable enables and disables spawning. The script will pick a random enemy prefab from enemyPrefabs and instantiate it. The next two arrays will specify a minimal and maximal value of speed and health. The spawn area is that green box you saw in the Scene view. Finally, you'll need a reference to the Player and pass it as target to the bad guys. SpawnEnemies() gets a reference of a game object with tag Player and determines whether an enemy should spawn. Start() initializes the spawn area and schedules the invocation of a method 0.5 seconds after the game starts. It will get called repeatedly every second. Besides acting as a setter method, SpawnEnemies() also gets a reference of a game object with tag Player. Now, you need to write the actual spawning code for an individual enemy. All that spawnEnemy() does is pick a random enemy prefab, instantiate it at a random position and initialize the Enemy script public variables. EnemyProducer.cs is almost ready to go! Run the game and check it out - an endless stream of bad guys! Okay, those cubes don't look terribly frightening. Time to spice things up. Run the game; you'll see different prefabs spawn inside the Arena. It won't take long before you realize that you're invincible! As awesome as that is, you need to level the playing field a bit. Now that you have shooting, movement and enemies in place, you'll implement a basic game controller. It will restart the game once the Player is "dead". But first, you'll have to create a mechanism to notify any interested parties that the Player has reached 0 health. An event is a C# language feature that lets you broadcast changes in objects to any listeners. To learn how to use events, check out Unity's live training on events.. The script will need to have some control over the enemy production, as it doesn't make sense to spawn enemies once the Player has perished. Also, restarting the game means you will have to recreate the Player which means...that's right, it will become a Prefab. In Start(), the script gets a reference to the Player script and subscribes for the event you created earlier. Once the Player's health reaches 0 onPlayerDeath() will be called, stoping enemy production, removing the Player object from the scene and invoking restartGame() method after 3 seconds. Here you're doing a bit of cleanup: you destroy all enemies in the scene and create a new Player object. You then reassign the camera rig's target to this instance, resume enemy production, and subscribe Game Controller to the player death event. Now return to Unity, open the Prefabs folder and change the tag of all Enemy prefabs to Enemy. Next, make the Player game object into a Prefab by dragging it into the Prefabs folder. Create an empty game object, name it GameController and attach the script you just created. Hookup all the required references in Inspector. Run the game again to see the game controller in action. If you're keen to learn how to design, code and publish your own games built in Unity, check out Unity Games by Tutorials. I hope you enjoyed this tutorial and found inspiration to take a crack at that game you always wanted to create. Questions or comments? Join the discussion below!